Saturday 25th November saw a capacity field of 1,000 athletes take on Willowfield Temperance Harriers Seeley Cup 10k road race in Belfast’s Ormeau Park with the race also incorporating this year’s Northern Ireland & Ulster Championships. The bitterly cold conditions did nothing to diminish the quality of the racing with Kenyan Gideon Kipsang (Derry Track Club) securing victory from Northern Ireland International Scott Rankin (Foyle Valley AC). Despite setting the early pace Scott’s efforts weren’t enough to stop the challenge from Gideon and it was the Kenyan who secured first place in 30.39. Scott took second place and with it the Northern Ireland & Ulster title in a time of 30.56. 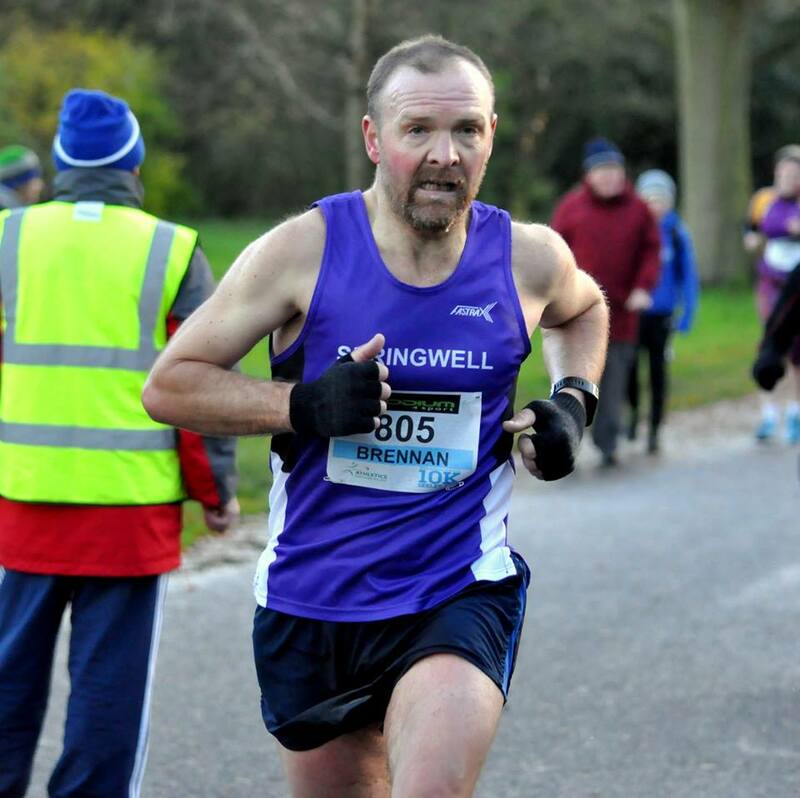 Third place was a closely contested race and it was Neil Johnston (Springwell RC) who claimed the final podium place with a new Springwell RC record of 31.05. Danny Mooney (Letterkenny AC) completed the NI & Ulster podium in 31.09 and fourth place overall. In the U20 race Luke Dinsmore (Springwell RC) continued his excellent recent form finishing 26th overall in 33.09 to win the age category. The ladies race was a closely contested affair between Northern Irelands two in form athletes. NI 10,000m and 5,000m record holder Emma Mitchell (QUB AC) and Belfast Marathon winner Laura Graham (Mourne Runners) went stride for stride until the final kilometre. As the ladies entered Ormeau Park for the final time, Emma surged clear to retain her NI & Ulster 10k title in 34.00. Finishing with a personal best of 34.19 Laura claimed second with Kelly Neely (City of Lisburn AC) completing the podium in third with a time of 35.49. Ciara Toner (Springwell RC) had another excellent racing finishing as second F35 with a new Springwell RC record of 37.01. In the team competition, North Belfast Harriers secured top honours in both the male and female categories. City of Derry AC and Springwell Running Club picked up silver and bronze medals respectively in the men’s race, while Beechmount Harriers took silver in the ladies table; Ballymena Runners secured bronze. The quickest and easiest way from Portaferry to Strangford is to pay the £1.00 fee and take the ferry. However, if you’ve a bit more time on your hands, there’s the 53.3 mile ‘Loop the Lough’ Ultramarathon organised by Atlas Running. Starting in Portaferry, with the finish in sight across the narrow stretch of water, runners follow the Shore Road to Newtownards before heading on to Comber, Whiterock, Killyleagh and Downpatrick before finishing at the Cuan Bar restaurant in Strangford and effectively running round Strangford Lough. So at 6.00am on Saturday 25th November Springwell RC’s Helena Dornan took her place on the start line in Portaferry in icy driving rain and sleet with 53.3 miles of running ahead of her. Despite the rain clearing within an hour of the start the freezing temperatures and icy road conditions made for challenging running conditions which didn’t improve much as the day progressed. Challenging as the conditions were, Helena’s experience was more than enough to see her finish 5th overall and 1st lady with a personal best time of 9.02.48 for the distance. 33 Springwell RC members took part in Parkruns at 7 different venues with one PB recorded. At Limavady Andrew Kincaid completed his 50th Parkrun.